Confession: I love Disney. You may have gathered that in my Disney World post HERE, but it is one of my childhood obsessions that has carried over into adulthood. There’s nothing wrong with being young at heart right?! 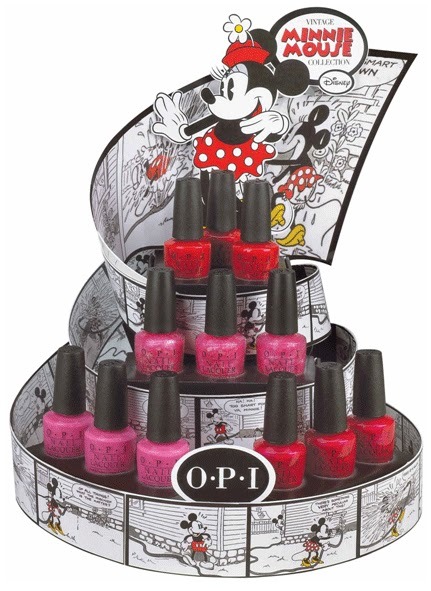 SO as you can imagine my inner little girl was jumping up and down when I found out that OPI was releasing a Minnie Mouse collection. It includes 4 colors in all my favorite nail polish shades: pinks and reds with AH-dorable names. From top to bottom in the picture below: "Color of Minnie," "Nothin' Mousie 'Bout It,", "I'm All Ears," and "If You Moust you Moust." While all these colors are pretty fab I went with the classic red "Color of Minnie" as you can see in my nail photo below. It's a pretty vibrant red, perfect for summer. So all-in-all the Minnie Mouse collection is VERY cute & you should def check it out. However I’m still waiting for OPI to release a Barbie collection. Then my life would be complete. Please tell me I'm not alone in loooooving this song. Anyway thanks so much for reading loves and I hope you have a fabulous Monday!